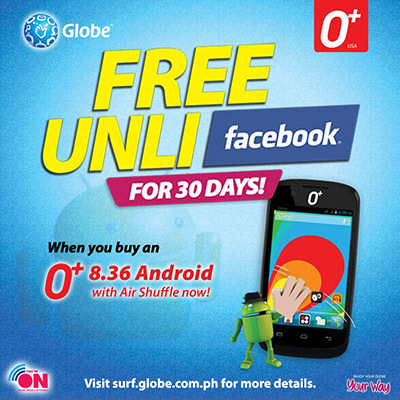 Buy a new O+ USA 8.36 Android Device at any participating outlets from May 24 to August 24, 2013, and get FREE Unlimited Facebook Access via m.facebook.com valid for 30 days. Promo Duration: To join the promo, you may purchase your O+ USA 8.36 Android device from participating stores nationwide from May 24 to August 24, 2013 via cash or instalment. Redemption of your FREE Unli Facebook may be done from May 24 to October 24, 2013. Promo Coverage: All authorized O+ Telco Shops. To qualify, just buy any Globe specially bundled O+ USA 8.36 Android device within the promo period from participating stores nationwide. The special bundle comes with a Pocket Guide and GHP SIM with FREE Unlimited Facebook valid for 30 days. To activate, just register using your FREE SIM by texting FREEFB30D and sending to 8888. You will receive a confirmation message upon successful registration. See www.surf.globe.com.ph for full details and list of participating stores. Visit Globe Telecom Facebook page for latest updates.